The SP-280 sliding door operator, sold worldwide since 2006, is universally applicable and impressive due to its superior performance. 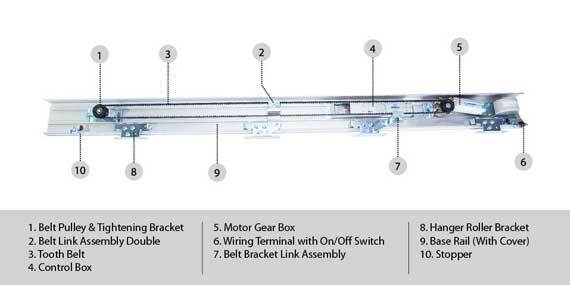 Equipped with power 80W motor, this system that can operate even heavier doors with smooth, robust efficiency. With proven track record in international markets, its high-quality materials and the latest motion sensor technology guarantee a premium performance. Its long working life, universal application and the absolutely smooth and silent door movements make SP-280 instantly recognizable in the industry. It simply cannot fail to impress. It can with gentle ease move heavy door leafs and at the same time, it offers the maximum opening speed in the market. It gives architects and developers a scope for imagination in their projects as it allows for very high and wide opening. It is universally applicable and can be used for almost any entrance, whether commercial, private or public. It is suitable for single and double leaf doors, light or heavy, frameless and toughened glass systems and framed doors. It can be used for exterior or interior doors, for escape routes and high security areas. Suitable for automatic sliding doors which are subject to high traffic volumes; where specious entrance opening, functionality and safety are factor.